Technology sector employers, who represent the largest share of H-1B visa users, tell the public that the H-1B program is vital to their ability to find the highly skilled workers they need. Yet Department of Labor data tell a different story. Previous studies have found that the H-1B program is primarily used to import low-wage workers.1 This report examines the most recently available wage data on the H-1B program and finds that the trend of low prevailing wage claims and low wages continues. In addition, while industry spokesmen say these workers bring needed skills to our economy, on the H-1B Labor Condition Applications (LCAs) filed with the Department of Labor, employers classify most of their H-1B workers as being relatively low-skilled for the jobs they are filling. This report compares prevailing wage claims and wages employers reported for H-1B workers in computer programming occupations in FY 2005 to wages for U.S. workers in the same occupation. Although the H-1B program stipulates that employers must pay H-1B workers at least the prevailing wage for their occupation and location, the results of this report clearly demonstrate that the regulation does not produce that result. The findings in this report clearly demonstrate that the legal definition of the prevailing wage requirement does not ensure H-1B workers are paid the actual market prevailing wage. Employer prevailing wage claims and reported wages for H-1B workers are significantly less than those for U.S. workers in the same occupation and location. This suggests that, regardless of the program’s original intent, the H-1B program now operates mainly to supply U.S. employers with cheap workers, rather than with essential skilled workers. Very few H-1B workers are "highly-skilled." Employers who used the Department of Labor’s skill-based prevailing wage system classified most workers (56 percent) as being at the lowest skill level (Level I) as did most State Employment Security Agency (SESA) wage determinations (57 percent). This suggests that most H-1B computer workers are low-skilled workers who make no special contribution to the American economy, or that employers are deliberately understating workers’ skills in order to justify paying them lower salaries. According to the applications filed in 2005, it appears that employers may be significantly understating what U.S. computer workers are earning in order to justify paying low wages to H-1B guestworkers in those occupations. In FY 2005, H-1B employer prevailing wage claims averaged $16,000 below the median wage for U.S. computer workers in the same location and occupation. 90 percent of H-1B employer prevailing wage claims for programming occupations were below the median U.S. wage for the same occupation and location, with 62 percent of the wage claims in the bottom 25th percentile of U.S. wages. While higher than the prevailing wage claims, the actual wages reported for H-1B workers were significantly less than those of their American counterparts. Wages for H-1B workers averaged $12,000 below the median wage for U.S. workers in the same occupation and location. The reported wages for 84 percent of H-1B workers were below the median U.S. wage; 51 percent were in the bottom 25th percentile of U.S. wages. Many employers make prevailing wage claims using wage sources that are not valid under the law. The Department of Labor routinely approves prevailing wage claims based on these invalid sources. The purpose of this report is to examine the effectiveness of the prevailing wage requirements in the H-1B program and to determine whether there is a difference between wages for H-1B workers in computer programming fields and wages for U.S. workers in the same fields. This report uses the Bureau of Labor Statistics Occupational Employment Statistics (OES) as the measurement of U.S. wages and the H-1B Labor Condition Application disclosure data to measure H-1B wages. This report updates a December 2005 Backgrounder, "The Bottom of the Pay Scale: Wages for H-1B Computer Programmers. "2 The previous report examined Labor Condition Applications filed in FY 2004. The procedures used in this report are nearly identical to those used in its predecessor. There were three reasons for producing a new report based on the same type of data. First, this new report confirms that the results from 2004 were not a fluke. Repeating the same measurement on the subsequent year’s data produced nearly identical results. Another reason for a new report is that new data became available. Last year, for the first time, the Department of Labor made available the skill-based wage data. This makes it possible to examine how employers classify the skills of the H-1B workers they are seeking. Finally, a second look allowed investigation in more detail on exactly how employers produce the extremely low prevailing wage claims. This H-1B visa was created in 1990 to provide a separate guestworker program for certain specialty occupations. A specialty occupation is one that requires a college degree or equivalent professional experience. There is no specific skill requirement for an H-1B visa. The H-1B program is, in theory, a non-immigrant program, although it is widely used as a stepping stone to permanent residency. H-1B visas are valid for up to three years and can be renewed once for an additional three years. H-1B visas also are tied to employment, so an H-1B visa becomes invalid if a worker loses his or her job. While employed, it is relatively easy for a worker on an H-1B visa to transfer the visa to another employer. However, H-1B workers seeking permanent residency are effectively bound to their employer because changing jobs requires restarting the application process, making it unlikely that it will be completed before the visa expires. Transfers do not extend the time limit on the original visa. The disclosure data are divided into two databases, one representing electronic filings, the other representing fax filings, with the electronic filing database containing the bulk of the records. These two databases have different structures so integrating them is not as simple a process as it might be. For completeness, this report includes the data from both sources. However, other researchers could legitimately ignore the fax data as they increase the average H-1B wage by only $2. The reason for using the disclosure data as a measure of H-1B wages is that they are the best data available on wages for H-1B workers. This is the data Congress mandates be made available to monitor the H-1B program. In the future the author hopes to be able to repeat this analysis using the data from visa applications. So far, USCIS has responded to requests for this data by stating it cannot find the information. The disclosure data provide the best possible source for employer prevailing wage claims. Unlike the measurements of H-1B wages, all the prevailing wage comparisons to U.S. wages are direct comparisons. As such, they leave no doubt that employer prevailing wage claims do not reflect the actual prevailing wage. The source for U.S. wages was the May 2004 National Occupational Employment and Wage Estimates available at http://www.bls.gov/oes/2004/may/oes_nat.htm . The May 2004 data were the last released before the start of FY 2005. Therefore, they were the last published before any of the LCAs examined were submitted. This study also uses the 2005 FLC wage data (available at www.flcdatacenter.com) to match specific employer prevailing wage claims to their sources. These data were used to identify the job title used for prevailing wage claims and to analyze the nature of specific claims. They were not used for H-1B/U.S wage comparisons. The biggest challenge in analyzing the LCA data is to match employer job titles to the Standard Occupation Codes (SOC) used to classify jobs in the Occupational Employment Statistics (OES) produced by the Bureau of Labor Statistics. Rather than using SOCs, LCAs use broad numeric classifications in which managers of programmers get lumped in with programmers. Analysis of these data is made even more difficult because the job code entered by employers is frequently wrong. In assigning SOC codes to LCAs, this study tries to be conservative and take the path that would minimize the difference between H-1B and U.S. wages. The first step in this process was to select all records with computer-related job codes ("030" to "039") on the LCA. The next step was to match LCAs using OES as the prevailing wage source to the actual OES data to get an SOC code. The job title in each matching record was verified using pattern matching (e.g. using "*soft*eng*" for "software engineer"). For those records where pattern matching failed, they were individually checked to ensure that the SOC code actually reflected the job title. Pattern matching was used both to eliminate LCAs that were not programming related and to assign job codes. For example a pattern like "*vice president*" would be used to eliminate records for certain managerial employees and "*database admin*" to assign the SOC for "database administrator" to other LCAs. Some job titles created special difficulties. There are separate SOC codes for "Software Engineers, Applications" and "Software Engineers, Systems," with wages for the latter tending to be higher. In this study, all software engineers were classified as "Applications" unless "Systems" was specified in the job title or the prevailing wage claim had been matched to an OES record specifying systems software engineer. The most common job title was "Programmer/Analyst" (44 percent of programming workers). That could be either a "programmer" or a "systems analyst." This study chose to treat "Programmer/Analysts" as programmers except for the few cases (4 percent of "Programmers/Analysts") where the LCA’s prevailing wage claim had been matched to a specific OES record with a different job title. Classifying "Programmer/Analysts" as "Programmers" rather than "Systems Analysts" reduces the average H-1B to U.S. wage difference by about $4,000. LCAs with the job title "Consultant" were treated as systems analysts unless the LCA’s prevailing wage claim had been matched to a specific OES record with a different job title. While classifying "Consultants" as programmers would have given a smaller H-1B/U.S. wage difference, the SOC definition of a programmer is not applicable to consultants. H-1B/U.S. Wage difference, "Developers" were classified as "Computer programmers" unless the LCA’s prevailing wage claim had been matched to a specific OES record with a different job title. LCAs where the annual wage was less than $10,000 or greater than $300,000 were treated as errors and were excluded. The 130 records (out of 300,000 filed) excluded had an average wage of $11.5 million with the highest value $454 million. In addition, LCAs for part-time work were excluded. The statutes governing the H-1B program allow universities to pay the prevailing wage in academia rather than in the technology industry at large (See below). Academic H-1B wages averaged about $6,000 a year less than overall H-1B wages. In order to give a better comparison of what employers should be paying under the law to what they actually are paying, LCAs filed by universities are not included in the results. The requirements for prevailing wage claims are defined by statute and regulation. The statute (8 U.S.C. § 1182(n) (1)(A)(i)) specifies that H-1B workers must be paid the higher of either 1) wages page by the employer to similar employees, or 2) the prevailing wage. The regulations (20 C.F.R. § 655.731(a)(2)) specify how the employer determines the prevailing wage. As an illustration of how loosely defined the process is, the first section says "...the employer is not required to use any specific methodology to determine the prevailing wage…." One specific the regulations do give is that the prevailing wage is to be based on either the mean or median depending on the circumstances. Despite the complexity of the requirements, the statute provides no mechanism for DOL to verify employer claims; the LCA process is essentially an honor system. DOL adjudicators may only check that the form is filled out correctly — they may not investigate whether the LCA data contain bogus prevailing wage claims. There is insufficient information within the LCAs to cross-reference most LCA claims to the source of a prevailing wage claim, so there is insufficient information to determine the possible extent of a bogus prevailing wage problem. The fact that employer claims are not verified does not necessarily mean that the claims are wrong or bogus. The more important question is: How do employer prevailing wage claims compare to actual U.S. wages? What is the result of our reliance on an attestation system to protect U.S. workers? Table 1 shows how employer prevailing wage claims compare to actual U.S. wages. Employer prevailing wage claims on LCAs for computer programming workers averaged $16,000 below the median U.S. wage based on occupation and location. The median difference between employer prevailing wage claims and the median U.S. wage was $18,000. For employer prevailing wage claims, 90 percent were below the U.S. median wage and 62 percent were in the bottom 25th percentile of U.S wages. Figure 1 compares the distribution of U.S. wages to H-1B prevailing wage claims. Prevailing wage claims are one thing — actual wages are another. Reported wages for H-1B workers tend to be higher than employer prevailing wage claims. However, due to the fact that prevailing wage claims are extremely low, H-1B wages remain significantly lower than overall U.S. wages. Table 2 shows how wages listed for H-1B workers on LCAs compare to those for U.S. workers in the same occupation and location. H-1B wages averaged $12,000 below the median U.S. wage based on occupation and location. The median difference between employer prevailing wage claims and the median U.S. wage was $15,000. Wages for 84 percent of H-1B workers were below the U.S. median wage and 51 percent were in the bottom 25th percentile of U.S wages. The distribution of H-1B wages on LCAs is shown in Figure 2. Level I (entry) wage rates are assigned to job offers for beginning level employees who have only a basic understanding of the occupation. These employees perform routine tasks that require limited, if any, exercise of judgment. The tasks provide experience and familiarization with the employer’s methods, practices, and programs. . . . Statements that the job offer is for a research fellow, a worker in training, or an internship are indicators that a Level I wage should be considered. Level III (experienced) wage rates are assigned to job offers for experienced employees who have a sound understanding of the occupation and have attained, either through education or experience, special skills or knowledge. . . . Words such as ‘lead’ (lead analyst), ‘senior’ (senior programmer), ‘head’ (head nurse), ‘chief’ (crew chief), or ‘journeyman’ (journeyman plumber) would be indicators that a Level III wage should be considered. These skill levels only apply when the Department of Labor is used as the prevailing wage source. In FY 2005, along with defining prevailing wages with four skill levels, the Department of Labor made its skill-based data available in table form for the first time. This allows one to match prevailing wage claims using this data to the specific source record used to make the claim. From a matching record, one can identify the skill level the employer claimed. About two thirds of the computer programming LCAs using this wage source could be matched back to the source record. An examination of the skill levels reported on the LCAs reveals that employers claim that the majority of their H-1B workers are entry level. In stark contrast to claims that the H-1B program is used for "highly-skilled" workers, employers claim the majority are less-skilled workers. 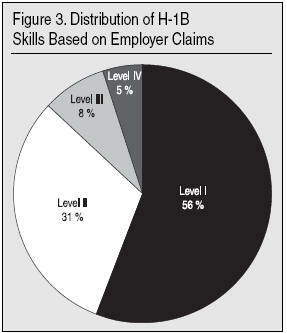 Figure 3 shows the distribution of employer skill claims on LCAs. This report and its predecessor both found employer prevailing wage claims on LCAs were much lower than actual U.S. wages. This section examines how employers calculate such low prevailing wage claims. Appendix B provides an overall picture of prevailing wage claims, and shows how wage claims are calculated using the most commonly used prevailing wage sources compare to actual U.S. wages. If one weights the difference between U.S. wages and the claimed prevailing wage for each wage source by the number of workers requested, three wage sources account for about $14,000 of the $15,000 median difference between prevailing wages and the median U.S. wage: Occupational Employment Statistics (OES), State Employment Security Agencies (SESA), and Watson-Wyatt. Together, these wage sources are represented on 87 percent of the LCAs, covering 93 percent of the workers requested. OES is the most commonly used source for prevailing wage claims. It is used on 70 percent of the LCAs representing 50 percent of the workers. LCAs using OES account for about $8,000 of the total wage difference. Since OES is the wage source this report uses to measure actual U.S. wages, it might appear contradictory that LCAs using OES as the prevailing wage source contribute the most to the difference between U.S. wages and employer prevailing wage claims. This apparent discrepancy is easy to explain. When the H-1B program was created, it required employers to pay workers the higher of the prevailing wage for the occupation and location, or the wage paid to similar employees. By requiring H-1B workers to be paid the overall prevailing wage, in theory it would prevent employers from using the H-1B program to import young, lower-paid workers to displace older U.S. workers. As discussed, in 2004 Congress added a new prevailing-wage option for employers. It mandated that the Department of Labor provide employers with four skill-based prevailing wages. To comply with this change, the Foreign Labor Certification Data Center took the OES data produced by the Bureau of Labor Statistics and used them to create four skill-based prevailing wages. This created a mechanism for employers to justify low wages. Regardless of the actual skills of an H-1B worker, employers need only assert that a worker is in the Level I category for entry level, trainee, or intern employees, and pay according to that prevailing wage. The findings described above show that, according to employers’ LCA claims, the majority of H-1B computer programming workers are indeed at the lowest skill level (Level I). The difference between the Level I wage and the OES median wage averages about $14,000. While the use of Level I wages as the prevailing wage is by far the most significant reason for low prevailing wage claims using the OES data, the LCA data also contain a number of completely bogus prevailing wage claims that purport to use OES as the wage source. Because most LCAs do not contain the information necessary to match a prevailing wage claim back to its source, it is impractical to determine the extent of these bogus claims. Table 3 shows some examples of OES-based prevailing wage claims that are lower than the Level I wage for the occupation and location. A small number of these low wage claims are the result of employers improperly using the prevailing wage for higher education, as in the last claim. The fact that these erroneous applications were processed at all illustrates that LCAs are not checked for accuracy, much less fraud. This should be a routine aspect of any government benefit issuing process, and is often automated. Clearly, maintaining the integrity of H-1B processing is a low priority for the Department of Labor. Of LCAs, 9 percent used SESA as the prevailing wage source, representing about 13 percent of the workers requested. The LCAs using SESA account for about $3,000 of the average difference between prevailing wage claims and the median U.S. wage. Like employer-made, skill level-based OES prevailing wage claims, SESA determinations overwhelmingly tend to be based on low skill levels. 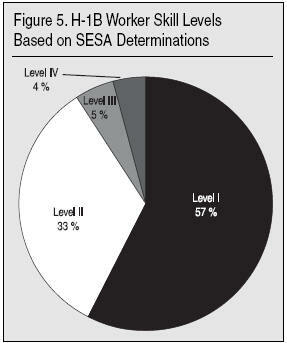 Figure 5 shows how SESA determinations classify skill levels. Watson-Wyatt was the most commonly used private source for prevailing wage claims. 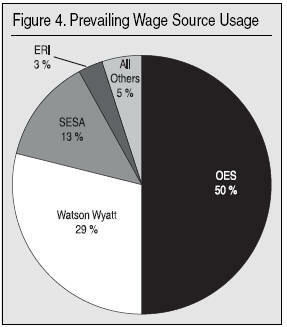 Wage claims using Watson-Wyatt account for about $3,000 of the median difference between the average claimed prevailing wage and the OES median wage. Citing confidentiality, Watson-Wyatt would not provide any information about the nature of their wage survey. Salary.com was the wage source giving the highest prevailing wage claims (averaging about $2,000 below the U.S. median). The 755 LCAs using Salary.com as the prevailing wage illustrate some of the problems in verifying prevailing wage claims. About half of these LCAs list the job title as some variant of "Programmer/Analyst." Due to the fact that this is not a job title listed on Salary.com, one can only guess what job title employers used to determine the prevailing wage. Salary.com’s prevailing wages are based on three levels for each job title (e.g., Programmer I, Programmer II, and Programmer III). Because most LCAs using Salary.com as the prevailing wage source do not include the level, it is impractical to match large numbers of these wage claims to their sources. Even LCAs that match the Salary.com job title and level exactly are difficult to match to their source, because Salary.com does not maintain historical data. To illustrate, one LCA is for a "Programmer I" in Edison, N.J. The claimed prevailing wage is $56,500. Unfortunately, that LCA claims to use 2005 data. For August 2006, Salary.com says the median is $58,784. The discrepancy here is probably due to wage variations over time. Another LCA is for a "Software Engineer I" in Greensboro, N.C., and claims the prevailing wage is $44,497. The August 2006 data from Salary.com give $51,372 as the median wage and $45,129 as the 25th percentile wage. In this case it looks like the employer has improperly given an artificially low prevailing wage by claiming the 25th percentile as the prevailing wage. On nearly every LCA using Salary.com as the wage source and where the job title could be matched exactly, the claimed wage appeared to come from the 25th percentile rather than the median. Prevailing wage claims based on the 25th percentile are invalid under the regulations. Table 4 shows some typical examples. During the LCA approval process, the Department of Labor does not evaluate the validity of the prevailing wage source. Many LCAs use wage sources that are invalid under the law. For example, the law requires the prevailing wage source to be a local measurement of wages. However, many LCAs use national surveys as the wage source. Applications citing such prevailing wage sources tend to be among the lowest prevailing wage claims. The second-lowest prevailing wage source is the MIT Wage Survey, which reports offers made to MIT graduates nationwide. It, too, is a national survey and does not meet the requirements of a valid prevailing wage source. The third-lowest prevailing wage source on LCAs is wage surveys conducted by employers themselves. Not surprisingly, when employers determine the prevailing wage on their own, the resulting prevailing wage claims tend to be among the lowest submitted. Of employers using their own surveys, 38 percent had all of their prevailing wage claims below the 10th percentile of U.S. wages, raising reasonable doubts as to their legitimacy.Extremely low wages are not the only sign that employer surveys are subject to abuse. The median number of workers requested by employers using employer wage surveys was one, with 90 percent requesting three or fewer. It is difficult to explain how so many employers could conduct legitimate salary surveys for one, two, or three employees. ComputerWorld magazine’s wage survey was listed as the source of the fourth-lowest prevailing wage claims. However, ComputerWorld could not verify any of the prevailing wage claims on the LCAs in the database that listed them as the source. They also observed that the wages reported in their survey were "consistently higher" than wage claims made on LCAs. This suggests that DOL should make some effort to verify employer claims, as some may be deliberately providing bogus information on LCAs. The preparation of this report involved many weeks of examining LCA data. While outside the scope of this report, a number of questionable patterns were found. Some of those patterns involving computer occupations are listed here in the hope that other researchers might investigate them. Many employer addresses listed on LCAs are not bona fide business addresses. These include residences and mail drops. The number of LCAs filed for certain states suggests that the number of H-1B workers exceeds the number of jobs. For example, the number of LCAs filed for New Jersey suggests that the number of H-1B programmers that are supposed to be working in the state greatly exceeds the number of programming jobs created in the state. Some groups of LCAs contain identical data except for the employer contact information. One such group had five employers, three of which listed a residence as the business address. Wages for computer programming managers were also significantly below the median for U.S. workers in those occupations. These findings indicate that if there is any correlation between wages and skills, it is clear that the H-1B program is rarely being used to import "highly skilled" computer programming workers. The newly available data on skills suggest one of two things is happening, neither of which is consistent with the claims of employers pushing for the expansion of the program. Either the H-1B program is used primarily to import relatively less-skilled, entry-level, or trainee workers (and thus is of dubious value to the American economy), or employers are lying about these workers’ skills in order to suppress their wages. While the wage data suggest that a few employers use the H-1B program to import a small number of highly skilled workers, these are exceptional cases. Overwhelmingly, the H-1B program is used to import workers at the very bottom of the computer programming wage scale. Many in the information technology industry have called for an increase in the number of H-1B visas available. However, given the very few H-1B workers earning salaries that highly skilled workers in their profession would make and the fact that employers classify most H-1B workers at low skill levels, this report concludes that the existing number of visas is more than ample for the nation’s needs. Contrary to industry claims, the perennial exhaustion of the H-1B visas due to the cap more likely reflects widespread preference for lower-paid workers and lax enforcement of program rules, not an insufficient supply of visas to meet a deficit of highly-skilled U.S. workers. Limit the number of H-1B visas that an employer can obtain each year based on the size of its U.S. workforce. Require employers to have a bona fide business office. Applications from residences and drop boxes should not be not be approved. Compel employers to use a standard wage source produced by the federal government when making prevailing wage claims for LCAs. This report has shown that employer prevailing wage claims are much lower than the actual prevailing wages, and that some employers make mistakes or deliberately provide bogus prevailing wage claims. Oblige employers to pay H-1B workers at the 75th percentile of the pay scale, rather than at the prevailing wage. This would provide a strong incentive for employers to use the H-1B program for highly-skilled and needed workers. Require employers to enter a Standard Occupation Code (SOC) for each employee on the application. Most employers are already looking this information up in order to get OES prevailing wages, so it would require little effort to put this information on the LCA. USCIS should make wage and employer information available for those H-1B visas actually issued. Remove the restrictions on the LCA approval process to allow the DoL to verify the content of LCAs. Remove all restrictions on enforcement. Specifically, eliminate the requirement that the Secreatary of Labor approve investigations and allow random audits of employers. 1 See for example Norman Matloff, "On the Need for Reform of the H-1B Non-Immigrant Work Visa in Computer-Related occupations," University of Michigan Journal of Law Reform, Fall 2003. (H-1B), FY 2005, November 2006. 4 U.S. State Department, Office of Visa Services, Non-Immigrant Visa Workload, 2005, at http://www.travel.state.gov/pdf/fy%202005%20niv%20workload%20by%20catego... .
5 Raghu, K., "Infosys net soars 49.2 per cent, guidance thrills Street," Daily News and Analysis (India), July 12, 2006.ho represent the largest share of H-1B visa users, tell the public that the H-1B program is vital to their ability to find the highly skilled workers they need. Yet Department of Labor data tell a different story. Previous studies have found that the H-1B program is primarily used to import low-wage workers.1 This report examines the most recently available wage data on the H-1B program and finds that the trend of low prevailing wage claims and low wages continues. In addition, while industry spokesmen say these workers bring needed skills to our economy, on the H-1B Labor Condition Applications (LCAs) filed with the Department of Labor, employers classify most of their H-1B workers as being relatively low-skilled for the jobs they are filling. This report compares prevailing wage claims and wages employers reported for H-1B workers in computer programming occupations in FY 2005 to wages for U.S. workers in the same occupation. Although the H-1B program stipulates that employers must pay H-1B workers at least the prevailing wage for their occupation and location, the results of this report clearly demonstrate that the regulation does not produce that result. The findings in this report clearly demonstrate that the legal definition of the prevailing wage requirement does not ensure H-1B workers are paid the actual market prevailing wage. Employer prevailing wage claims and reported wages for H-1B workers are significantly less than those for U.S. workers in the same occupation and location. This suggests that, regardless of the program’s original intent, the H-1B program now operates mainly to supply U.S. employers with cheap workers, rather than with essential skilled workers.